Well today is the last day of August and this means that school will start again next week. Before we know it October and Halloween will be here. For today's card, I have used this delightful stamp from High Hopes Rubber Stamps called By the Moonlight. I coloured the image with Copic Markers. Hope you enjoy this last long weekend of the summer with your family, before the usual routines start up again. Follow the One Crazy Stamper blog as the DT Divas will be bringing Daily Inspiration throughout the month. You can also follow us on Facebook, Instagram and Pinterest. Thanks for stopping by today and have a great day. Next week the kids will be going back to school. As you can imagine both the parents and the kids have mixed feelings about this. My neighbour's 4 year old will be starting junior kindergarten. She is excited and nervous all at the same time - understandable right?! My card today features Mary J Teacher Angel from High Hopes Rubber Stamps. The card colours are not traditional school colours but I wanted to try something different.......and I didn't have school themed paper in my paper stash - gasp! so I had to step outside the box and challenge myself to find a way to use what I did have. I coloured sweet Mary J with alcohol markers and fussy cut her. I chose my lined background paper - appropriate for school right?! 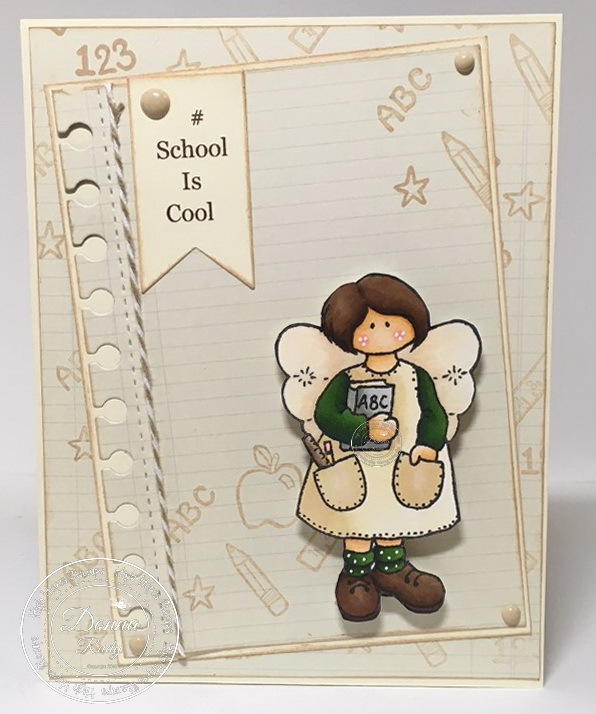 and used the school background stamp to create my patterned paper. A letter edge die helped on the edge of one piece to keep my school theme. All the edges are inked with matching ink. Next I designed and printed my sentiment on my computer and cut it out with a fishtail banner die. It is hard to see in the photo but I added some clear sparkle pen to her wings. 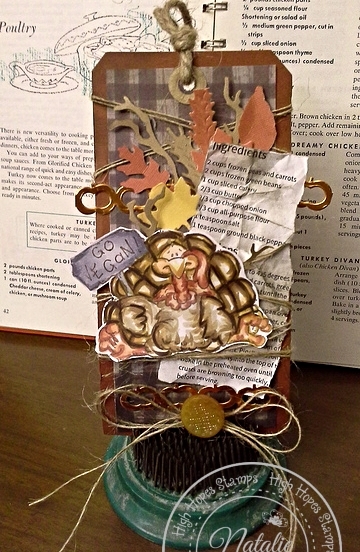 Some simple twine and matching gumdrops finish off my card. Follow the One Crazy Stamper blog as the DT Divas will be bringing Daily Inspiration throughout the month. Don't forget to follow us on Facebook, Instagram and Pinterest. The sky is blue today which is quite the change for us in British Columbia, as most days the sky is grey or orange from all of the forest fire smoke that surrounds us. 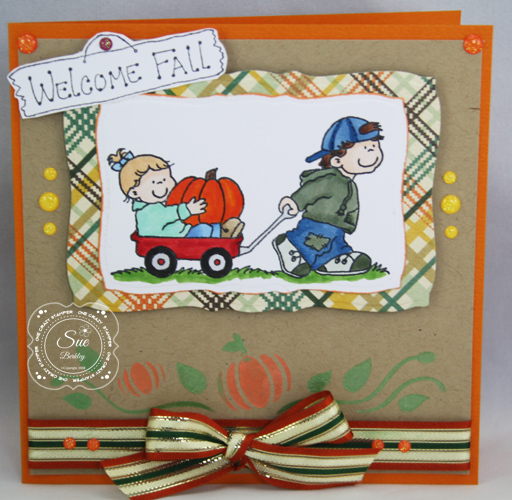 So to celebrate I have created this cute card featuring one of my favorite fall stamps from High Hopes Rubber Stamps. 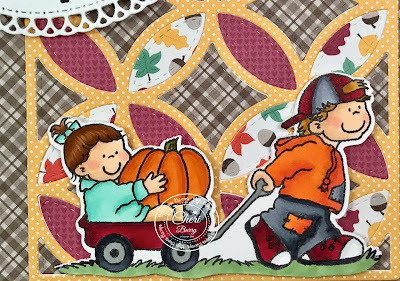 The image is entitled "Pumpkin Patch" (S152), and I have stamped it on Copic Xpress It cardstock with Memento ink, and then colored it with Copics. 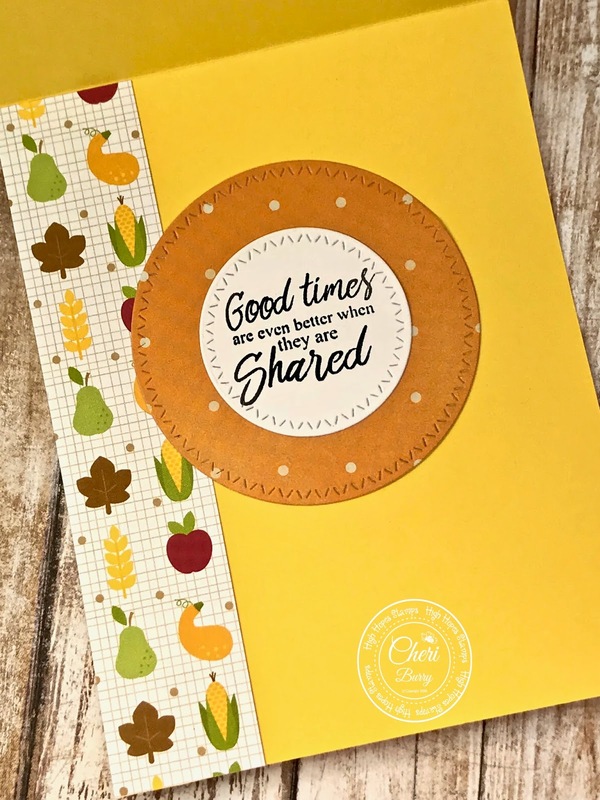 The card front is paper from my stash and the sentiment is from a CC Designs sentiment set. 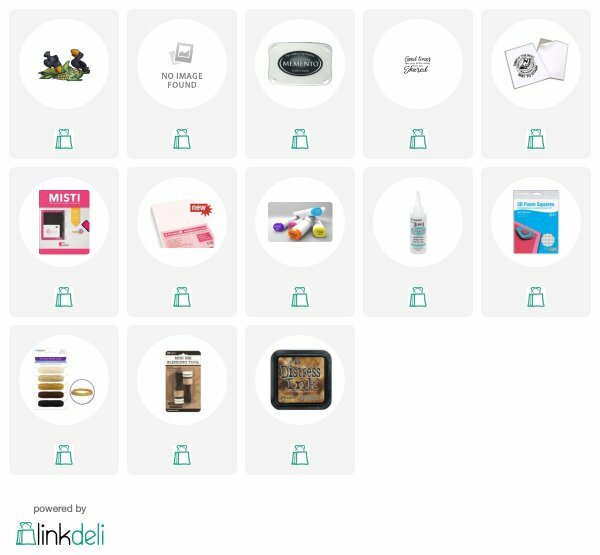 I hope you are enjoying the last week of summer wherever you are, and please check out the design team posts as the ladies are showcasing some beautiful projects. It's Tuesday so that means it's my turn to post over on the High Hopes and One Crazy Stamper Blogs! 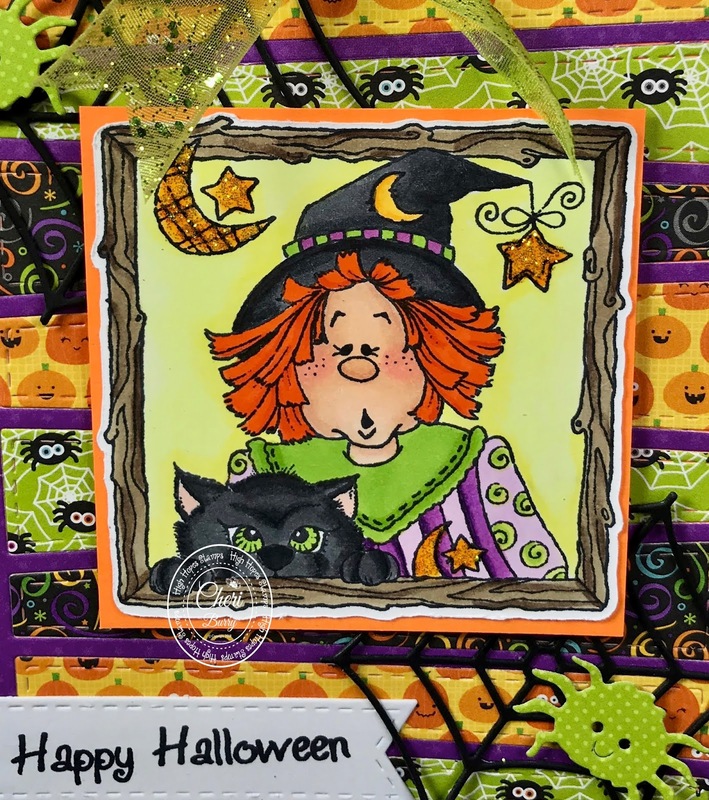 The theme this month is Fall/ Halloween, so I've chosen the oh so adorable "Witchy Poo with Kitty Frame" to make my card with. 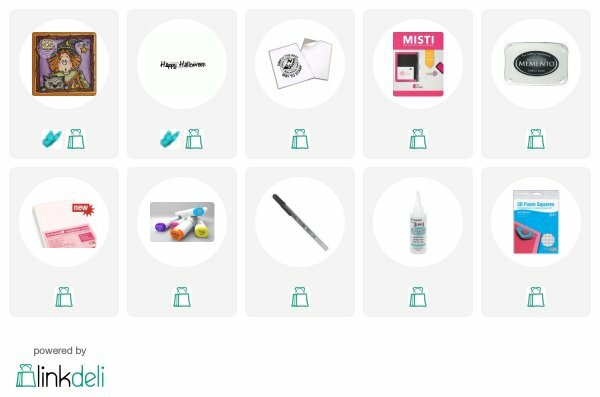 I started by first making my background for my card base. 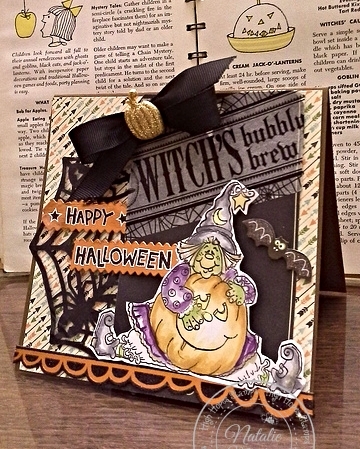 I just got the YNS "Funky Line Panel Die" and thought it would be perfect for "Witchy Poo". 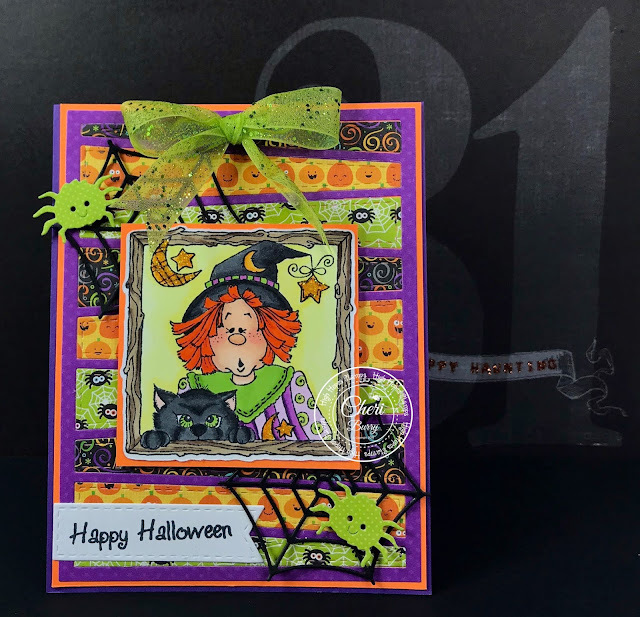 I pulled out my stash of older Doodlebug Halloween paper and added strips for a fun background. Then I coloured my image to match my paper choices. A few spider webs complete with cute green spiders and a bow were my embellishments this time. I added Yellow Stickles to the moon and stars. The sentiment is also from HH and is called "Simple Halloween". Hi there High Hopes fans, Happy Saturday!!!! I'm back to share a Fall-ish / Halloween creation. 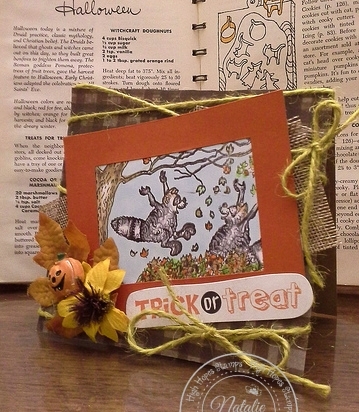 sweet Halloween pumpkin, leaves and sunflower. 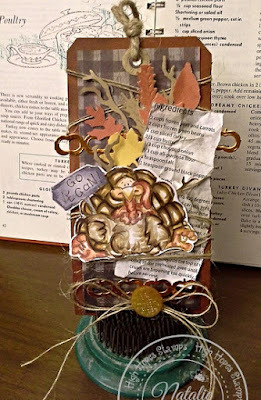 Some Fall twine, burlap and pattern paper too. Love this scene. 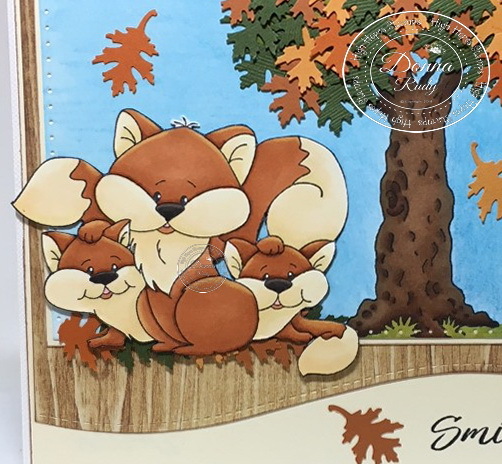 They are having such fun in the leaves. Make me smile every time I ink up this stamp. 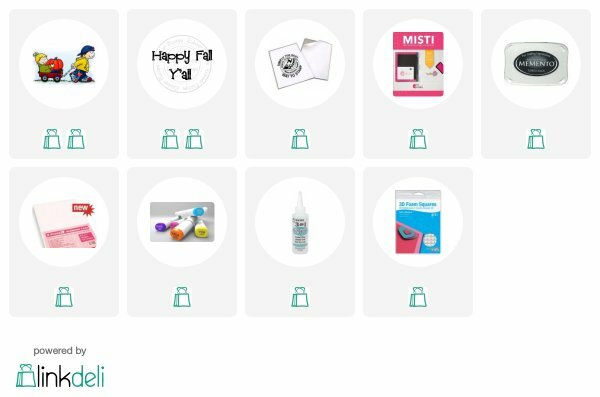 Follow the High Hopes Stamps blog as the DT Divas will be bringing Daily Inspiration throughout the month. 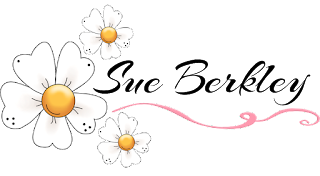 Don't forget to follow us on Facebook, Instagram and Pinterest. 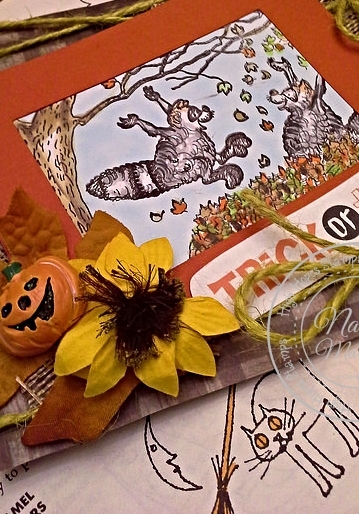 I hope you have been following and liking what the Divas have created for this month's Fall/Halloween Inspiration. 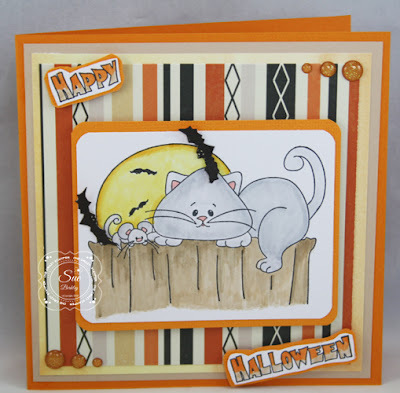 For today's post, I have a Halloween card using the cute stamp Bat Friends from High Hopes Stamps. This is a CAS using only one sheet of design paper. I let this paper add some magic to effect. I coloured the image with Copic Markers. I cut some bats out from a scrap piece of design paper and added them with glue dots. It is always nice to receive a surprise gift from a friend isn't it? 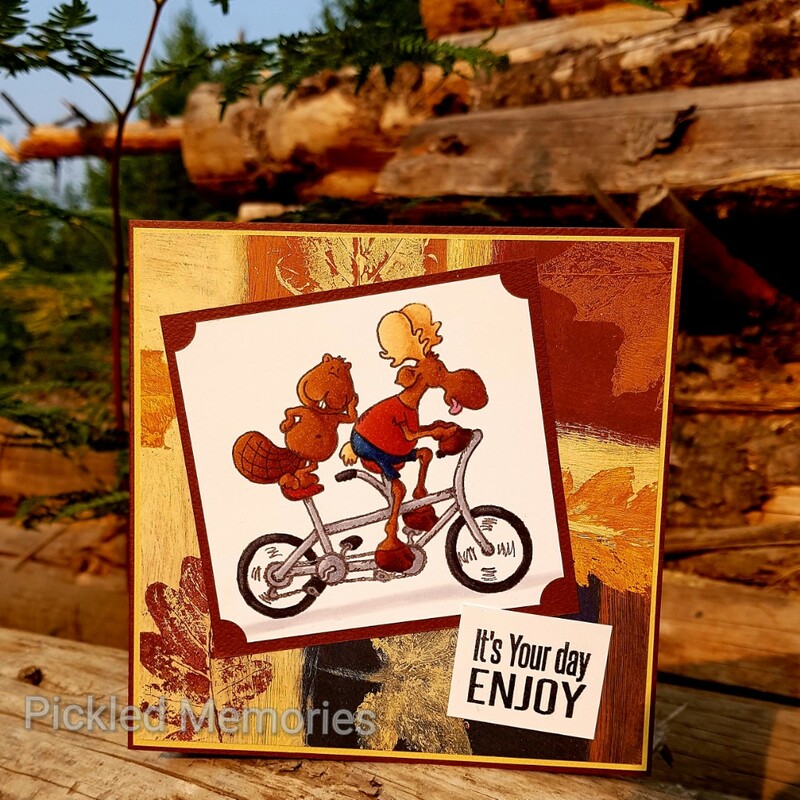 I don't always get the chance to do this but sometimes my friends do something so nice and unexpected that it is nice to give them a card and gift to thank them. This stamp has more of a spring feel to it but I wanted to challenge myself to make it into a fall feel card. 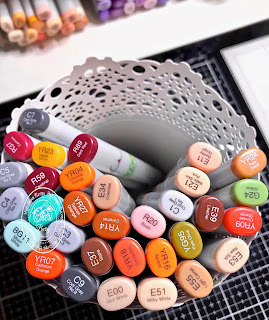 I am also hoping to inspire you to find different ways to use the stamps in your stash. 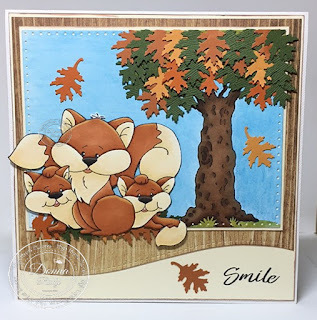 Changing the colours and paper can take a versatile stamp like this one and make it easy to use for any occasion or season. After colouring my stamp with alcohol markers, I cut it out with a stitched rectangle die. I added silver Wink of Stella to her earrings for a little bit of bling. The sentiment was stamped and mounted on matching cardstock. Some twine and enamel dots finish off my card. 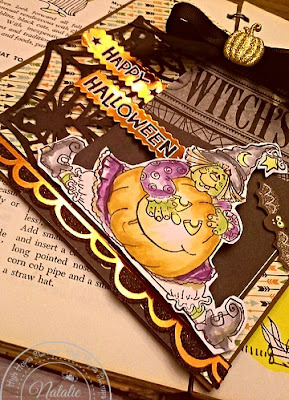 Sharing a little bit of magical fun today, with my card for this months theme of Fall or Halloween. 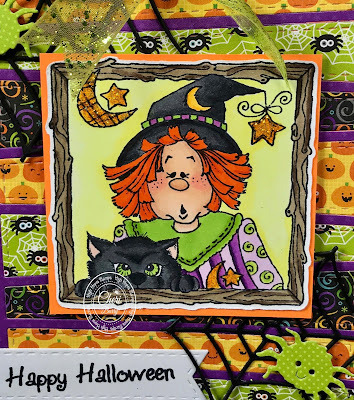 This adorable image is Little Wizard that I colored with Copics, then fussy cut and adhered to the card front. 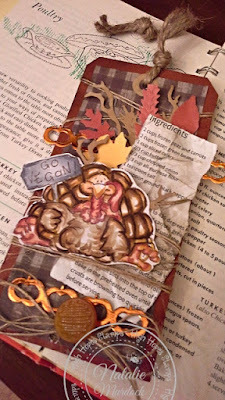 The card front was made with an older Martha Stewart punch and layers of paper. I just love this little wizard and his owl!! Silver Gel pen for the buckle on his hat, the owl eyes, and the stars from his wand. How cute are these little friends?!!! This is the "Wagon Full of Blessings" stamp from High Hopes. I love Fall with the cooler weather and colours of the leaves! 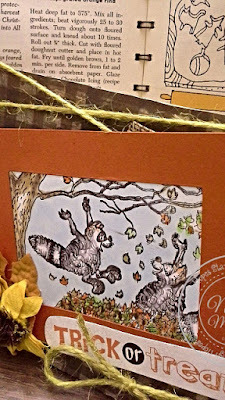 If you are in need of a little Fall inspiration, head on over to the OCS and HH Blogs. The Design Teams have been showcasing Fall/Halloween images all month! I used a Circle Quilt die and cut a few papers with it from the Lawn Fawn Sweater Weather 6x6 collection. I fussy cut my image and popped it up with foam tape for some added dimension. 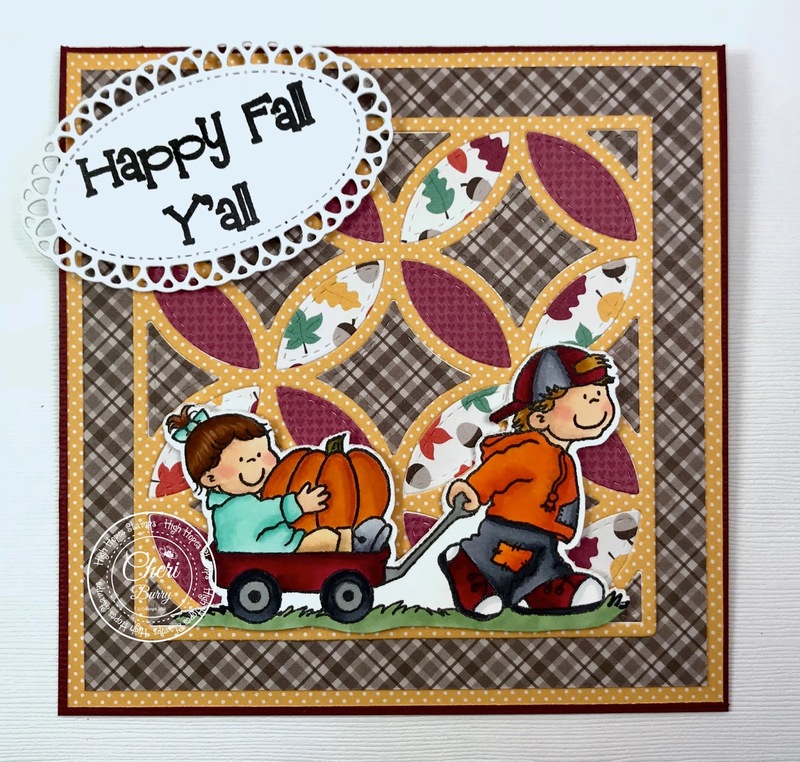 The "Happy Fall Y'all" sentiment just sums up my love of Fall. 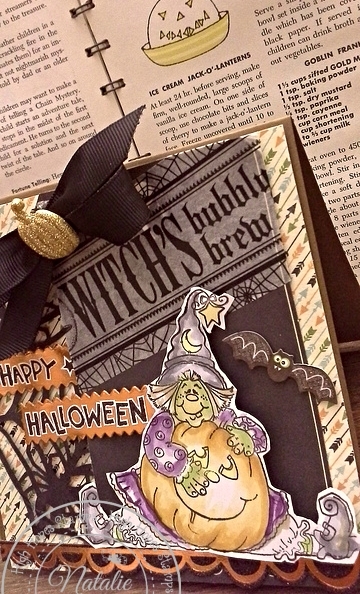 Just playing around with High Hopes …..
Made with Witchy Poo found here! One of my favorite Halloween Images. Love this witch! and pattern papers too. All ready for Halloween! 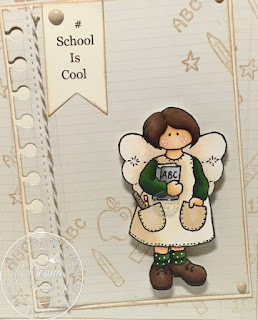 The summer as we know it, is almost over as the children go back to school in a couple of weeks. This means that Fall is approaching and before we know, Halloween will be here. 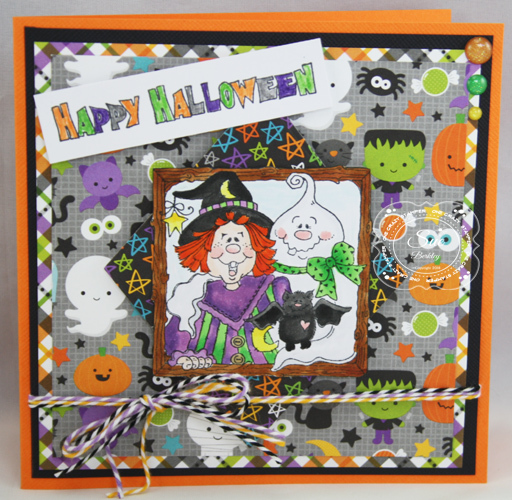 Today's card is a CAS one using the cute Halloween image called, Boo Crew in Frame from High Hopes Rubber Stamps. I used Copic Markers to colour the image after stamping with Tsukineko Memento Tuxedo Black Ink. Some twine and YNS Gumdrops finished off the card. I think fall is the perfect time for family photos. I love the natural tones of fall colours and I have seen a lot of family photo shoots done among the changing and falling leaves. My card today features the "Fox Friends" stamp from High Hopes Rubber Stamps. This stamp reminds me of some of the family pictures we had taken when I was younger. I have two brothers and sitting still for a family photo wasn't something that happened often! To me it looks like Momma is trying to get the little ones to sit still for the family photo. At least they are smiling! I coloured this cute family with alcohol markers and fussy cut them. Next I coloured my tree element and added some punched leaves to make my tree. 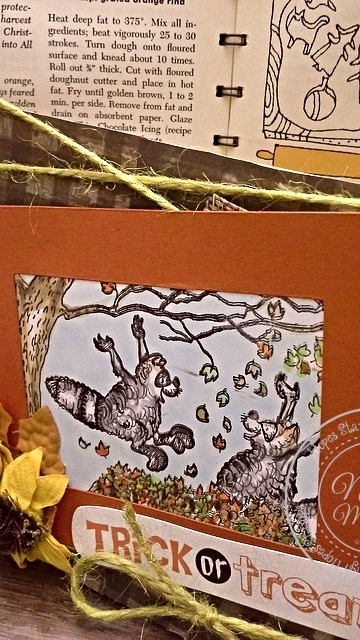 I added a wavy stitched edge to the patterned paper and inked the edges of the cardstock. The sentiment is part of a larger saying so I masked off the word I wanted and stamped it directly on to my cardstock. The sky is coloured loosley with a chalk pencil and then I used a piece of paper towel to blend it all together. A few extra falling leaves finish off my card. I'm back finally although this will be a short post as I still don't have internet - moving in the mountains is a test of patience as today is the fourth appointment with Shaw to get internet and cable working. Last week at the third appointment we got phones at least!! 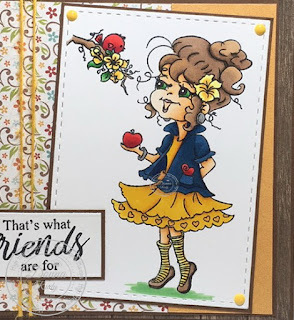 So for my card for today's post for One Crazy Stamper I have chosen the adorable image from High Hope's Rubber Stamps called Are We There Yet S087 and paired it with a sentiment from Sentiment Set #1. 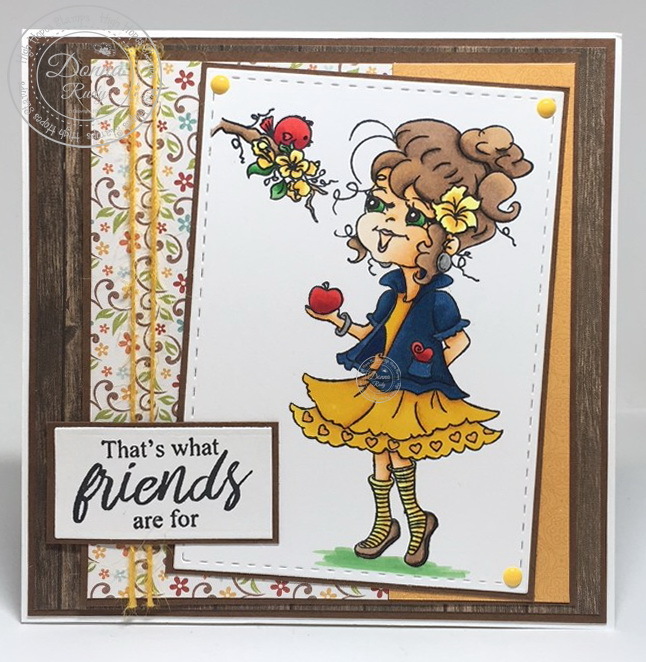 I hope everyone is enjoying the beautiful summer weather, and please check out the other design team members wonderful projects at One Crazy Stamper. Hello HH & OCS Fans! This month it's all about Fall/Halloween for the Design Teams over at High Hopes and One Crazy Stamper. I just thought the "We're All Ears" and "Cawnie and Cawrls Lunch" were so cute that I had to ink them up! Originally I wanted to have the corn cob as the card base but I didn't size it right with my Silhouette machine and cut a smaller version. So what's a girl to do?...... Mount it on the card front and add patterned paper LOL. I actually think it turned out better than the vision in my head! I used up some scraps from my patterned paper stash, fussy cut the images and mounted them on foam tape for some dimension. 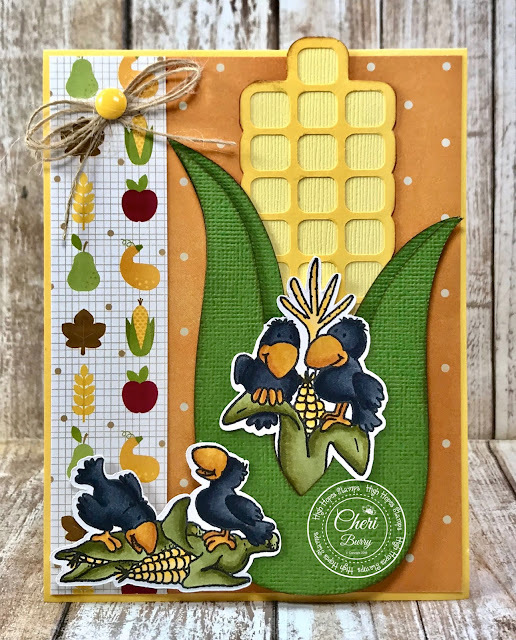 I also inked the edges of the corn cob with Vintage Photo to help it stand out as well. 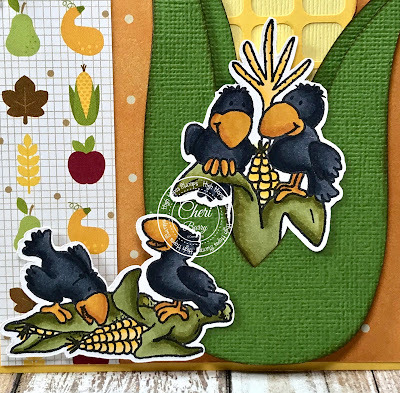 Since these cute blackbirds are all eating, I thought the sentiment "Good Times" was perfect for these friends sharing their lunch LOL. I can't wait for Fall to come. It is one of my favourite seasons, and it is colourful with the leaves changing colours, the abundance of pumpkins, Thanksgiving and Halloween. For today's card, I have used the Wagon Full of Blessings from High Hopes Stamps. This is a CAS card. 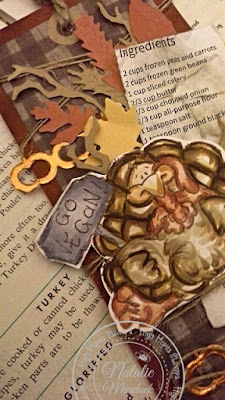 A small piece of Design Paper was used, so that there would be room to add some stenciling on the Kraft cardstock. I used Nuvo Embellishment Mousse in Orange Blush and Inka Gold in Jade to add colour to The Autumn Delight Stickable Stencil from BoBunny. When I opened the Inka Gold, it had harden over time, so I spritz some water on it which made it usable again. The same can be done with the Nuvo Embellishment Mousse. 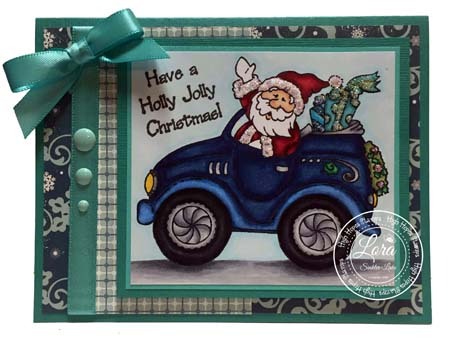 The image was coloured with Copic Markers, and some ribbon and enamel dots were added to finish it off. 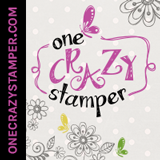 Do follow the One Crazy Stamper blog as the DT Divas will be bringing Daily Inspiration throughout the month. You can also follow us on Facebook, Instagram and Pinterest.